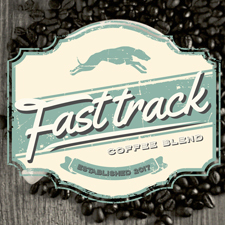 Grab a mug, pet a greyhound and enjoy the delicious Fast Track Coffee Blend! Coffee sales ended September 9. Did you miss ordering your coffee? Extra bags of coffee will be available for purchase at Gala. First come, first served. GPA-WI has teamed up with Wisconsin-based craft coffee roaster Stone Creek Coffee to offer the delicious Fast Track Coffee Blend at the GPA-WI Greyhound Gala fundraiser. Stone Creek offers a great fundraising program in which a non-profit organization can sell coffee to raise proceeds for its cause. The sales of Fast Track Coffee at the GPA-WI Greyhound Gala Gathering fundraiser will benefit GPA-WI and its mission of finding loving, adoptive home for retired racing greyhounds. Sales time frame: August 15 – September 9. Cost: Each 1 lb. bag is $15, and GPA-WI will receive $6 of every bag of coffee purchased. Purchase: Pre-sale purchases through PayPal. Limited quantities available to purchase in person at Gala. Pick up/shipping: Pick up pre-sale orders at the Gala fundraiser. Shipping also available. 2018 roast: “Cream City” caffeinated medium roast with chocolate and fruity notes. Decaf unavailable. Bean and ground: Both available, each in 1 lb. bags. K-cup: Unavailable. Ground Fast Track Coffee can be brewed using My K-Cup adapter. Winning logo: Each bag will feature the 2018 Gala Logo Contest winning logo. For questions and further information about Fast Track Coffee Blend, email GPA-WI volunteer Mary Koenig at Koenigm@sbcglobal.net.